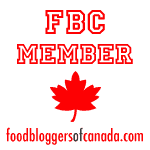 I must admit, I was never much of a fish eater until I started dating my husband. My father couldn’t stand the smell of fish cooking unless it was freshly caught and immediately cooked as during our vacations in New Jersey. So, whereas most Italians were serving only fish and seafood on Christmas Eve, we had a meat course. On the other hand, my husband’s family always served fish on Fridays and I became accustomed to his grandmother’s different ways of preparing fish. I now try to incorporate fish in our family menu as often as possible, but my children are still limited to breaded fish fillets and fried calamari or shrimp. Oh well, we’ll get there. 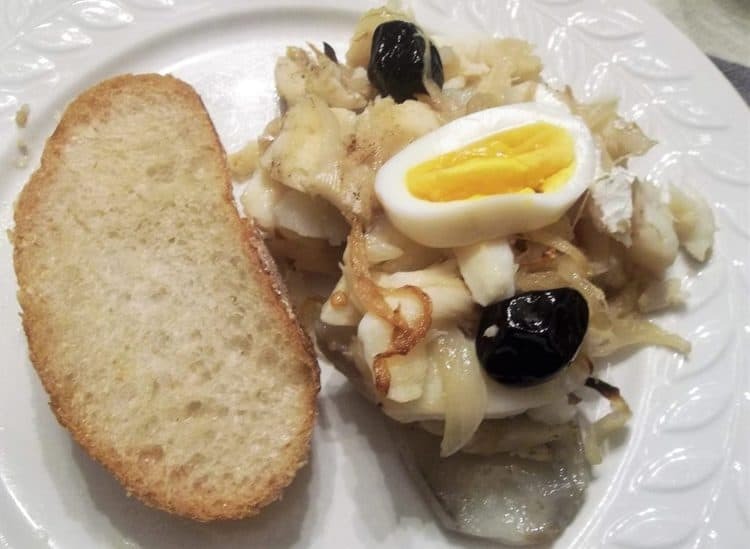 I started eating this Portuguese salt cod dish from a local take out place. It seemed like a simple dish and I attempted to recreate it at home. It was a success so two years ago I decided to serve it for Christmas Eve dinner for the entire family. For some reason we decided to get the salt cod from a different fishmonger and were told that their particular cod was not as salty and required only one day of soaking. Well, what a disaster as I took that fish out of the oven and it tasted like pure salt! I was furious! Thankful that I had tasted it before serving it to the family, I immediately tossed the whole thing out and made a pasta dish instead. What a waste! Now I get my cod from a reliable source, my mother! She purchases the salt cod, soaks it for 3 days and ever so kindly gives me a portion for my casserole. My husband and I enjoy this dish served with fresh crusty bread, if possible Portuguese corn bread. It’s great served right away, at room temperature or even the next day as a cold dish. Hopefully, someday my children will enjoy it as well. 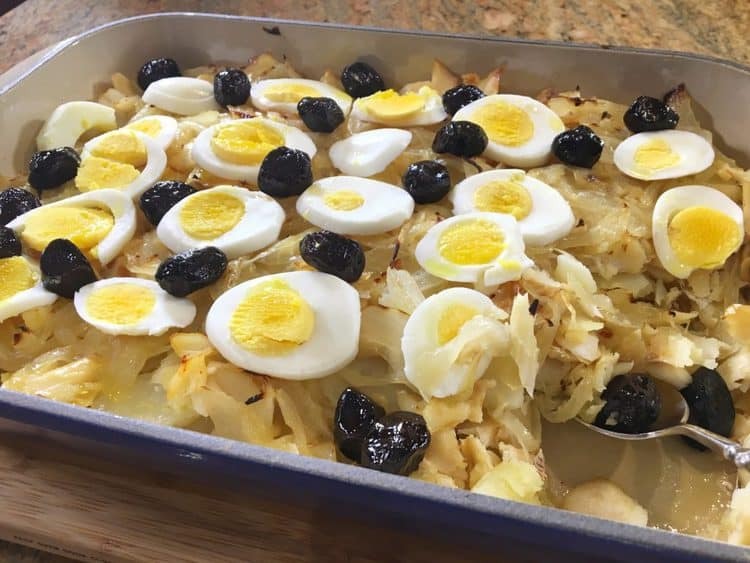 This interpretation of a traditional Portuguese dish has become a favourite served on Christmas Eve. It is also delicious served cold as a salad the next day. To prepare the cod, rinse the cod well under running cold water, place in a large bowl covered with water and soak for 3 days replacing the water at least 3 times daily. Peel the potatoes and boil in salted water until tender. Allow to cool and slice thinly, about 1/4 inch thick slices. Set aside. Meanwhile blanch the salt cod in boiling water (not salted) for 2 minutes. Allow to cool and break apart with your fingers into bite size pieces. In a large pan, heat olive oil and sauté sliced onions until golden, do not brown. Stir in hot pepper flakes. To assemble the casserole, oil a 12x10 inch casserole (or a similarly sized one) and cover the bottom with potato slices. Top with half of the cod pieces and top with half the sautéed onions. Repeat with remaining potatoes, cod and onions, forming 2 layers. Drizzle with olive oil. Bake at 350 º for half an hour. Before serving, top with black olives and sliced hard boiled eggs. Serve hot, at room temperature or cold as a salad.